Reliable & Consistent: After letting Bernard Berrian go due to the “lucrative” contract he signed (more than Briggs) with NFC North rival Minnesota, the Bears have answered the call by acquiring a wide receiver they have always called their “own”. Marty Booker will now be performing cross patterns and passing routes across the middle in Chicago after inking a two-year deal hoping to bring back the same productive weapon that shined in the aerial attack with Jim Miller. 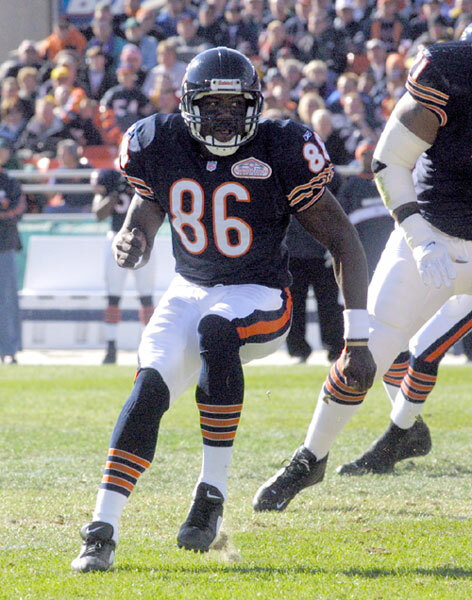 Booker, who holds the franchise record with 100 receptions from 2001, chose Chicago over the AFC representative New England Patriots and gives the Windy City some support at the position for not just the QB to throw but some help as a valuable blocker that the team can count on when they go outside with running plays. Even after trading Booker with a third-round pick to the Dolphins for sack artist DE Adewale Ogunleye in 2004, GM Jerry Angelo referred to him as “our Marty Booker,” a sign of the respect he tagged him with. It’s a good decision while possible candidates to replace Moose and Berrian, Bryant Johnson and D.J. Hackett (slim chances), are expected to sign elsewhere. Booker caught at least one pass in his final 58 games with the Bears, eclipsing Bobby Engram’s record of 57 consecutive games. Booker, who will turn 32 in July, ranks fifth on the Bears’ all-time receiving list with 315 catches and sixth with 3,684 yards. Booker was selected by the Bears in the third round of the 1999 draft (78th overall) out of Northwest Louisiana, which is now known as Louisiana-Monroe, the same school that produced former Bears safety Chris Harris and Bears second-year safety Kevin Payne. Booker remains the last Bears receiver to catch three TD passes in a game, a feat he accomplished on Nov. 18, 2001 in a 27-24 win at Tampa Bay. In The Trenches: As expected, Chicago officially declined to match the offer sheet the defensive tackle signed with Jacksonville on Monday. Kennedy signed a one-year contract for $605,000 (the minimum for a veteran with five years service) and a $50,000 signing bonus. 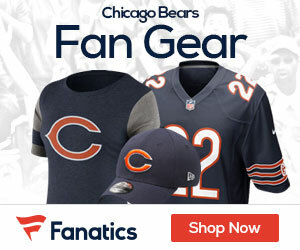 The former first-round draft pick of the St. Louis Rams was signed by the Bears Dec. 11 to a one-year contract. The Bears wanted him to take a two-year deal and when he dismissed it he had a right of first refusal written into the contract. Kennedy appeared in three games as a reserve for the Bears. It’s a need position, but coach Lovie Smith was never big on this bust lineman when he was with the Rams, and the Bears rather have Matt Toeaina (force against Minnesota in Monday Nighter), the the player they claimed off waivers from the Cincinnati Bengals the day after Kennedy was signed. The Bears are relying on Dusty Dvoracek to recover from a torn ACL to co-anchor the position with his Sooner friend, standout All-Pro Tommie Harris (contract extension is near). Dvoracek, who looked quick, powerful, and sharp enough to play the part next to Harris, has defensive coordinator Bob Babich envisioning an explosive 1-2 punch that the Bears defense will need to stop the run and pump the volume, setting the tone up front for LB’s to roam free and QB’s to feel uncomfortable. Drafting RB: In his latest mock draft released last Friday, ESPN.com’s Todd McShay believes that the Bears will choose Illinois running back Rashard Mendenhall, a game changer on offense, with the 14th overall pick. “Offensive tackle is certainly a possibility, especially with [Ryan] Clady, [Chris] Williams and [Jeff] Otah all emerging as solid first-round prospects behind Jake Long,” McShay writes. Among the players still on the board at No. 14 in McShay’s most recent mock draft are Otah, Stewart, Albert (plays both OL spots that we need) and Texas receiver Limas Sweed. Closer Look: I look at Mendenhall as the “real deal” and complete package at RB, though I have heard all this hype and hoopla before. He gives you more of a homerun hitter mentality than Stewart and will be more of an impact right away than an OL. You cannot afford to go into another season with “bust” Benson and his durability issues that pose huge concerns at an important position. The Bears offensively are at an absolute best when they run the football, but they may need OL more than RB at this point, pending any free agency moves that may be on the way. What I see in Rashard is cutback ability, vision, patience, and breakaway speed (haven’t seen this since “Sweetness”), potentially giving us a difference-maker at RB that has possess all these traits that are key for a successful runner. The thing I like most about him is that his running style is equally good inside between the tackles as he is outside the tackles in the open field, where he can make a man miss and take it to the house. With the 14th pick the team will make a decision based on the OL that go before them. However, the real question is, does Chicago think enough of him to go out and draft him despite past mistakes with running back disappointments – because we know there is a fine line between the next Walter Payton/Neal Anderson and Curtis Enis/Rashaan Salaam.